Looking for fun ways to keep your kids from getting bored at family gatherings? When children are young, introduce your kids to classic car games such as I Spy, I'm Going on a Picnic and The Name Game. If you're at a family home or vacation rental and want a fun unplugged group game, a fun classic option is charades. This classic pantomime game is ideal for family get-togethers, whether it's a charades party at Christmastime or a rainy-day activity at a family reunion. This game can include every generation of the family. Keep the rules simple when you play with kids. With a bit of help, even kids as young as three can play. Equipment: At a minimum you will want a watch or stopwatch app that counts seconds, although competitive types will want a real stopwatch. Basically, the game of charades is pantomime. Players act out a word or phrase without speaking. For example, "football" could be broken down by pointing to your foot and then pretending to throw a ball. For "car," you might pretend to sit with your hands on an imaginary steering wheel. 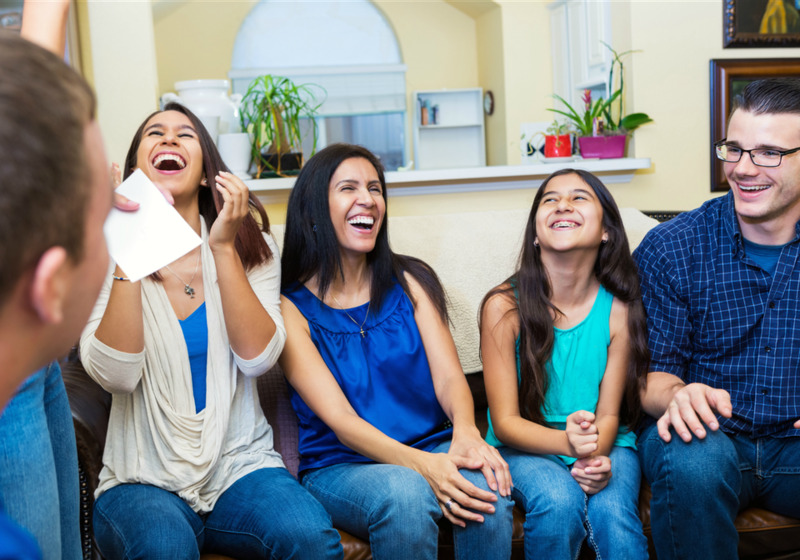 Charades can be played with any type of word or phrase, but with kids you may find that movie titles or TV shows work best. Most kids are familiar with many simple movie titles such as Sleeping Beauty or The Lion King. And even the youngest can act out Pinocchio. Usually charades is played by two competing teams in a race against time. On each turn, a single player acts out a phrase in front of his/her teammates. Use a stopwatch or app to track the time, giving a maximum of two or three minutes for each turn. The team with the least amount of total minutes and seconds wins. When playing with young kids, however, you might want to skip the stopwatch and the competitive element. Everybody gets two or three slips of paper. On each, write down the name of a movie, book, TV show, or phrase. Fold up the paper so that the words are not visible. Give your slips of paper to the opposite team. First, indicate to your team whether you're going to mime the title of a movie, book, person, song, TV show, and so on (see below). Next, indicate how many words are in the title by holding up that number of fingers. Next, indicate which word you want to start acting; hold up three fingers for "Third Word", and so on. Next, indicate how many syllables is in that word by placing that number of fingers against your opposite forearm. To indicate a movie, pretend to crank an old-fashioned movie camera. To indicate a person, stand with hands on hips. To indicate a song, place one hand on your chest and pretend to sing. For a place, draw an imaginary circle in the air and then point to the middle. To indicate a book, place your palms facing upward and pretend to be reading. To indicate a quote, make air quotes with your hands. For a TV show, draw a square in the air to represent a television screen. When someone calls out a correct word, point at that person and nod your head. Traditionally, the actor touches his/her nose, meaning "on the nose." To indicate a word that rhymes or sounds like another, cup your hand around your ear. To indicate a little word, bring your thumb and index fingers close together. Your teammates should start calling out every little word that comes to mind ("on", "in", "the", "and," and so on) until you touch your nose to indicate that it is the right word. For a longer version of the word, pretend to stretch an elastic band between your two hands. For a shorter version of the word, make a chopping motion with your hand. To indicate that guessers are close, make a 'come here' motion to keep the guesses coming. To prompt guessers to string the whole phrase at once, sweep your arms in a big circle. For past tense, wave your hand downwards behind your back. For opposite, make the "thumbs up" sign with each hand and point the thumbs in opposite directions.